curly-coated, hairy, hirsute, Haired, curly-coated. 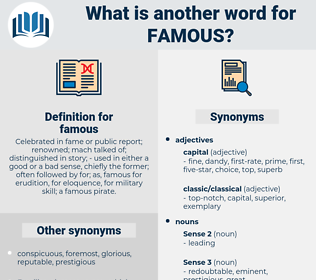 What is another word for famous? 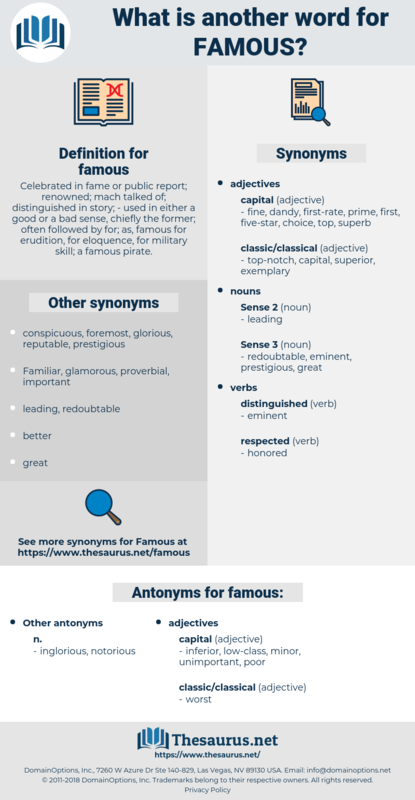 Celebrated in fame or public report; renowned; mach talked of; distinguished in story; - used in either a good or a bad sense, chiefly the former; often followed by for; as, famous for erudition, for eloquence, for military skill; a famous pirate. illustrious, prestigious, proverbial, renowned, celebrated. Familiar, acclaimed, reputable, legendary, world-renowned, much-vaunted, fabled, Vaunted, notable, memorable, much-discussed, great, so-called, wonderful, landmark, leading, glorious, dreaded, pre-eminent, high-profile, glamorous, well-established, successful, outstanding. inferior, low-class, minor, unimportant, poor. not good, bad, unacceptable, second-rate. inconspicuous, obscure, unknown, unnotable, unremarkable. atrocious, awful, contemptible, shameful, disgraceful. insignificant, undignified, powerless, infamous, uncelebrated, weak. mediocre, low-grade, lousy, terrible, unexceptional, substandard, pathetic, undistinguished, execrable, unsatisfactory, rotten, wretched, vile, unpopular, middling. In the center of this church, or whatever it was, Petru saw the famous fountain on whose account he had taken so long a journey, a fountain like any other, with nothing extraordinary about it. Both my brothers are for the Church; but, as for me, I know I should have made a famous little soldier! feminise, funny house, finocchio, finance, fibbing, fancy, finch, finnic, famish, fang, fiancee, fiance, finnish, feng shui, funky, Funnies, finances, fungous, fence, finis, funka, fawning, funk, fink, funkaceae, fenusa, finish, feminize, fivepence, foaminess, fungus, fumes, fomes, fennic, foaming, funniness, faunus, fungia, fineness, faineance, finesse, feminineness, fewness, faience, fungi, finicky.